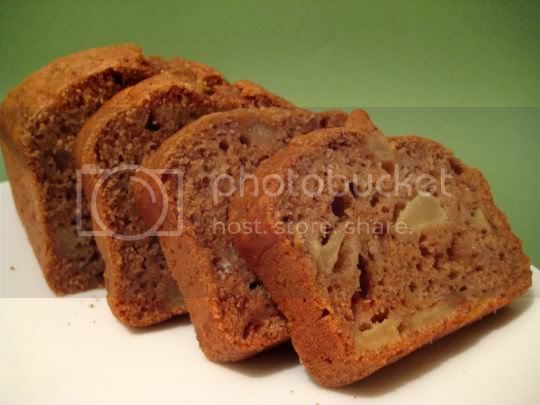 A yummy, hearty, spice-filled bread that's chockful of sweet, juicy pears. This is the perfect fall bread, great for breakfast, dessert, or a simple snack with a hot cup of tea. Your standard quick bread method of combining wet and dry ingredients, canned pears are mashed and mixed with sugar, eggs, applesauce, and oil. Flour is combined with the usual leavening agents, plus a large amount of cinnamon and ground cloves. The bread is so fragrant (especially while baking), and the flavor follows through as well. Although the pears are mashed for the batter, a fair amount of chunks remain through the bread, and they stay juicy and delicious even after baking. However, the moistness of the bread due to the pears makes this rather delicate when slicing (and this should definitely be stored in the fridge to prevent any mold from growing). This recipe makes four mini loaves, but I think two regular loaf pans could be substituted. Make again? Yes, quick and easy prep leads to a fragant, fruit-filled bread.